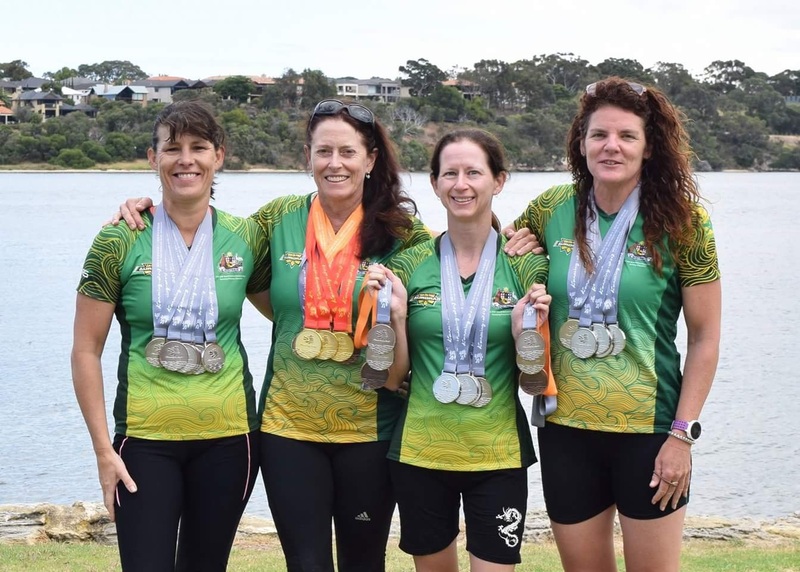 Cockburn Dragon Boat Club members Vivienne Wigg, Sharon Corsbie, Carlie Byrne and Kristin Priest returned from the World Dragon Boat Championships held in Kunming, China, in October, loaded down with ‘bling’. As members of the Australian Auroras team, they competed in 200m, 500m, 1000m and 2000m races in womens, mixed and open events. In total, they brought home 30 medals between them, including 3 gold, 22 silver and 5 bronze. Representing Australia on the world stage of dragon boating is no mean feat when residing in Western Australia. The honour of being an ‘Aurora’ comes with having to make a huge personal commitment and sacrifice, involving several trips interstate for selection and then ongoing training camps, hours in the gym to maintain the level of fitness required and 70 hours of paddling per week. Needless to say, as a club, Cockburn Blades is extremely proud of our Auroras and everything they have achieved. The Cockburn Dragon Boat Club is based at the East Fremantle Yacht Club, Petra Street, East Fremantle. Training sessions are held on Sundays 8am, Tuesdays 6pm and Thursdays 6pm. Social paddling is on Wednesdays at 6pm. Pictured below: Sharon Corsbie, Vivienne Wigg, Kristin Priest, Carlie Byrne.